The Dutch recently introduced meat that was grown in a science lab for what they say is way to grow meat without having to raise and kill livestock, which in turn would head off a looming food crisis. The cost of this new Frankenmeat is $330,000. 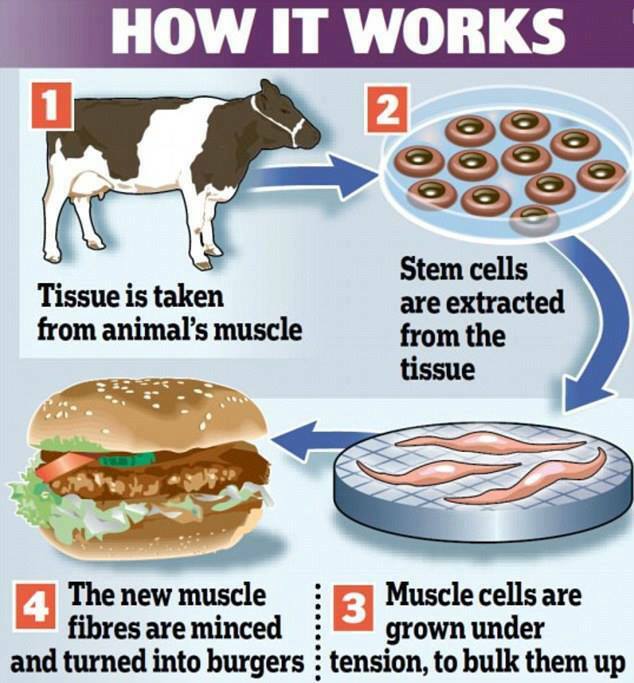 To understand how Frankenmeat is created, see photo attached. I do not believe we have or will have a food shortage crisis, or one that is looming. This is all hype. First, our earth’s land is enough to produce food for everyone. Second, the only livestock problems we have are directly related to the animals’ feed. Animals’ bodies were made to eat grass; that is what their digestive system was made for. Unfortunately, the animals are being fed corn and grain that are GMO and laden with Bt toxins, and other chemicals. This is what is killing them. See section on GMO in this blog to learn more. To make the animals healthiest for human consumption, they should be fed grass, their natural food. This entry was posted in Unsafe Foods and Additives. Bookmark the permalink.